In 2017, Machina Espresso took two big steps forward. First, in May, it started roasting its own coffee in a dedicated facility (sadly not open to the public) and then, in the summer, the second branch, the subject of today’s Coffee Spot, opened on Nicolson Street. In keeping with its roots, there is plenty of coffee kit on sale, although Nicolson Street stops short of grinders and espresso machines. Machina Espresso only roasts single-origins, with two choices on espresso (for drinks with and without milk), while there’s another on batch-brew. If you’re hungry, Machina Espresso has a good selection of cakes, plus a concise combined breakfast and lunch menu available until four o’clock (although the porridge is only available until 11 o’clock). The second branch is on Nicolson Street in Edinburgh’s Southside, a few doors up from the venerable Kilimanjaro. In contrast to the original on Brougham Place, with its (now grey) façade, set well back from the street, Nicolson Street is a striking near-black, the name emblazoned across the top, making it hard to miss. The deeply-inset central door is flanked by large floor-to-ceiling windows which form generous bays inside. Like Brougham Place, it’s fairly small, although where that’s a single, open space, this is cleverly broken up with scaffolding-style shelving units, feeling like lots of small, secluded spaces, although since the shelving is open, you can see most of the shop wherever you sit. Long and thin, it’s almost as tall as it is wide, and, while it’s not that wide, it’s still very tall. Left of the door, the fist of the two window-bays has a two-person, L-shaped window-bar, while to the right, there’s a two-person square table, a bench-seat in the window itself. Next comes multiple retail shelves on the right-hand wall, followed by the counter, long and thin like the shop itself, its short side facing the window. The cakes come first, then the till, followed by twin Mythos 1 grinders and the two-group La Marzocco Linea espresso machine. Finally, there’s an EK-43 for the batch-brew (and any retail sales which need grinding). There’s more seating along the side of the counter, where a pair of square, two-person tables make their home, sitting under the grinders/espresso machine. Meanwhile, there’s more seating on the left-hand side, starting just to the left of the door with a pair of square, two-person tables. Next is a long, thin table running front-to-back, split into two two-person tables by the first of the shelving units. The rear section is directly opposite the espresso machine, part of a cosy little alcove with a three-person bar at the back, level with the end of the counter. Beyond this, the space on the left is occupied by the toilet, while on the right, stairs lead down to a staff-only basement. This leaves a narrow gap in the middle which houses the remaining seating. There’s another thin, shelf-like table on the right with three bar-stools, while on the left, a final square, two-person table nestles up against the wall. Right at the back is another bench seat with a coffee table, perhaps the best (and certainly most intimate) spot in the whole shop. Laptop users should note that while Machina Espresso is pretty laptop friendly, the (free) Wifi is turned off over lunchtime (from 12 to 3 o’clock). That said, there is reasonable coverage from Edinburgh’s free Wifi service, particularly if you sit at the front. Liked this Coffee Spot? Then check out the rest of Edinburgh’s speciality coffee scene with the Coffee Spot Guide to Edinburgh. 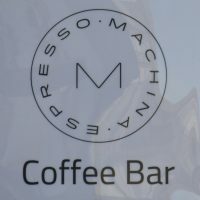 This entry was posted in Breakfast, Cafe/Roaster, Cafes, Cake, Edinburgh, Equipment Sales, Laptop Friendly, Lunch, Retailers and tagged include, Machina Espresso by Brian Williams. Bookmark the permalink.